Tori is a central, easy-to-find event space right next to Robert's Coffee. 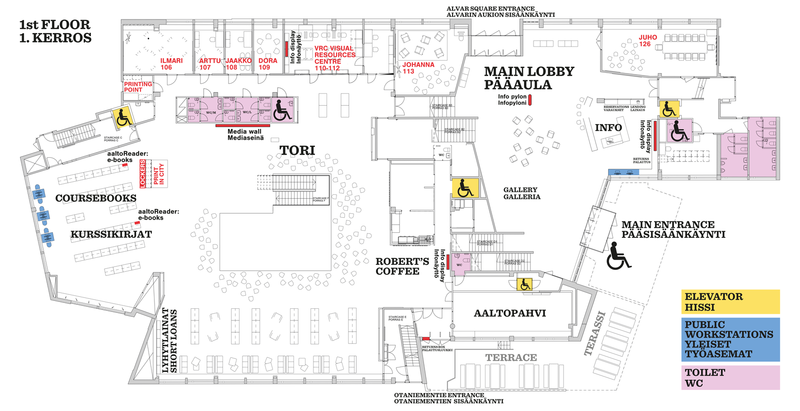 Tori is located on the 1st floor, adjacent to Robert’s Coffee. In total there is about 600 square metres of space to use and it can facilitate events up to 150 people. Use of the media wall is included in the Tori events. The wall consists of two large screens, each formed of four 55″ displays. You can control each of the two screens separately or mirror them. Sound can be played back from one source through the speakers on both sides of the wall. You can also use media wall as part of exhibitions. During all events the normal activities of the Learning Centre should not be disrupted. Customers can come and go in the space and get the books from the collections. Before hosting an event or exhibition please study our guidelines carefully. Seating stools available in addition to cafe seats and tables.